Starbucks continues to face huge backlash after two black men were arrested in a Philadelphia store for "trespassing" and kept in police custody for roughly eight hours. The store's manager called 911 on the men -- who were waiting for a third man to arrive for a business meeting -- after they tried to use the bathroom without making a purchase. A video of the men being taken into custody as other customers insisted the two had done nothing wrong led to a massive outcry on social media, culminating with a personal apology from the company's CEO. 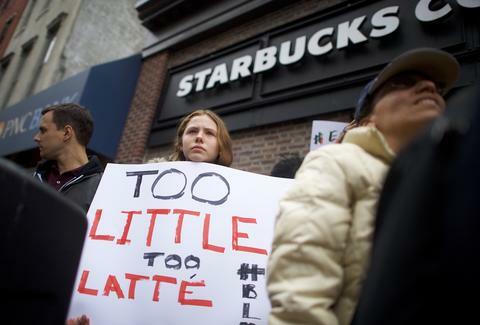 But on Tuesday, Starbucks announced it is taking further action: The coffee chain will close all of its more than 8,000 American stores and its corporate offices on the afternoon of May 29 for racial-bias education. The program will be "designed to address implicit bias, promote conscious inclusion, prevent discrimination and ensure everyone inside a Starbucks store feels safe and welcome." This will mean training 175,000 employees with a program that will become a permanent part of the onboarding process. The curriculum is being put together with guidance from Bryan Stevenson, founder and executive director of the Equal Justice Initiative; Sherrilyn Ifill, president and director-counsel of the NAACP Legal Defense and Education Fund; Heather McGhee, president of Demos; former US Attorney General Eric Holder; and Jonathan Greenblatt, CEO of the Anti-Defamation League. The experts will then be involved in monitoring and reviewing the measures as they are implemented, and the materials will be available to other companies for similar training. On Monday, CEO Kevin Johnson met with and apologized to the two men, though the details of the conversation weren't made public. He also spoke at a Philadelphia town hall and met with local leaders like Mayor Jim Kenney and Police Commissioner Richard Ross and appeared and apologized on ABC’s Good Morning America. The store where the incident occurred has seen several days of protests and sit-ins, featuring chants like "Starbucks Coffee is anti-black," and a storm of furious Yelp reviews that has brought its rating down to one star. The manager who made the original 911 call is no longer working for the chain, a parting that Starbucks described as “mutual.” It's unclear whether today's announcement will mean the end of those protests or not.